Many people make the mistake of assuming that since orchids are native to tropical rainforests, they must be watered several times a week. Unfortunately, watering this frequently will kill the roots of any orchid in short order. The general rule of thumb for orchids grown in the home is to water every 5 to 12 days, depending on the type of orchid, the temperature the plant is grown in, and the time of year. During the warm summer months when days are long, more frequent watering is required than in the cooler, shorter days of winter. 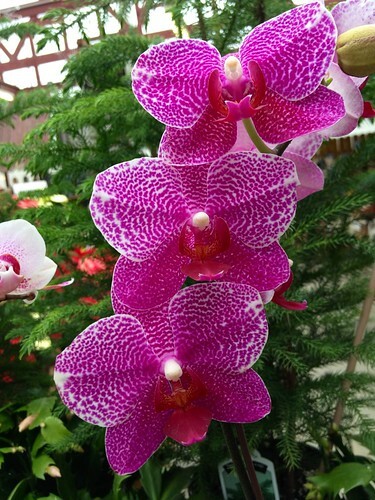 There are three basic types of orchids, as far as watering is concerned: those that should be kept evenly moist at all times; those that should be allowed to nearly dry out between waterings, except when in active growth; and those that should always be allowed to dry out a bit between waterings. Be sure to use an orchid food that is formulated for orchids and follow the instructions on the label. In general, most orchid fertilizers recommend usage once a month. Less frequent fertilizing may stunt growth and inhibit flowering; more frequent fertilizing may burn the roots and leaves and inhibit flowering. We recommend Jack's Classic Orchid Special from J.R. Peters. If your plant has healthy, with thick, green leaves that have not become wrinkled or drooping, cut the old flower stem up high, just above a "node" and just below the lowest bloom. The plant will frequently send out a new flowering branch at that location. If your plant has thin, wilted leaves, or if the plant is small, with only 3-to-4-inch-long leaves, it is best to cut the flower stem all the way down, so that the plant does not weaken itself by blooming again right away. Carefully water and fertilize your plant to build it back into shape for future flowering on a brand-new stem. This can take up to a year or more, as Phalaenopsis, like most orchids, is a relatively slow-growing plant. The most common reason for any orchid not to bloom is insufficient light. Move your phalaenopsis plants to a window where they will receive strong, but indirect light (near a south-facing window is ideal). You might also try lighting your plants with a fluorescent light fixture placed about 1-2 feet above the foliage. Give up to 12 hours of supplemental light per day. Phalaenopsis will also develop flower spikes in response to a cool period of about four weeks with night temperatures of 55F. After the cool treatment, raise the night temperature back to the normal 60-65F minimum. See if these changes to your growing conditions help to stimulate your plants to bloom. A newly potted phalaenopsis should be able to remain in its growth media two years before repotting. When there are many, long roots over the edge of the pot, this plant has most likely been growing for several years since its last repotting. If your plant is not currently in bloom, you should repot now. Be sure to remove all dead roots that are usually dark-colored, soft and mushy. Sometimes they may be dry, with a fiber running through the middle of the root. Center the plant with all of its roots down in the pot and add moistened bark until the level of the bark is just below the bottom of the lower set of leaves. Wait a week before resuming your normal watering and fertilizing routine.